A Stitcher's Journal. Blue Journal  - $12.96 : Yarn Tree, Your wholesale source for cross stitch supplies. Item 2032. Blue A Stitcher's Journal. Create a lasting diary of your needle art projects. Perfect for keeping a record of your stitching projects, as well as the fabric and threads used, for whom it was stitched, how it was finished and other details which are of interest. Room is provided for a 4”x6” photo of each of your finished projects. 31 projects can be recorded in each journal. Two storage pockets are also provided. 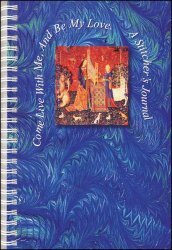 Archival quality, acid-free card stock is wire bound with a choice of two colorful, heavy weight covers, each featuring a beautiful medieval cluny tapestry. Measures 8¼”x5½”. Made in the USA.